How To Embed Twitter-Hosted Videos On Your Website? Following along the same lines as Facebook, Twitter recently announced a video-hosting feature that lets you capture and upload videos using official Twitter apps without having to upload them first on a third-party service such as YouTube. This was indeed a welcome feature, and in sharp contrast to how Twitter had been predominantly text-based and monotonous in the past. However, as with any video-hosting service, you need a way to share that video elsewhere on the web. For a video-hosting service, being able to embed videos is pretty important. If your videos can't be delivered elsewhere, what's the point? Not everyone uses Twitter to discover new content. 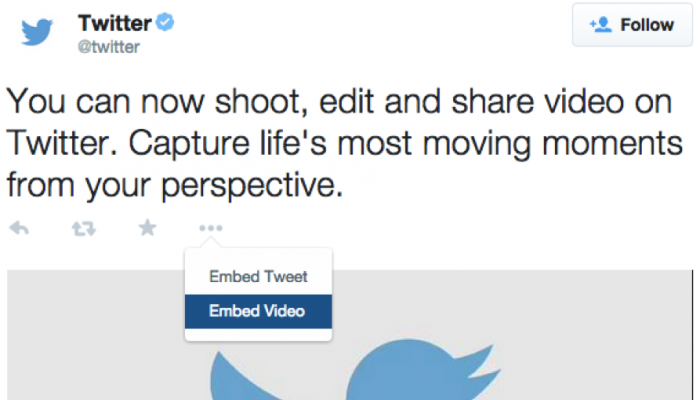 Twitter's video-sharing lacked the embed feature for videos hosted on Twitter. You could embed regular Tweets, but not Tweets with videos. Twitter has just announced a new embedded video widget, which works just like Twitter's official Tweet buttons and embedded tweets. Embedding a video is as simple as clicking on the ‘•••’ button in the tweet and selecting ‘Embed Video’, as pictured in the image below. Twitter will then render a piece of HTML code for you to copy and paste on your website. In addition to the video itself, the video widget will also display the full, original tweet. If your website is built on WordPress, and you’re looking for a more intuitive way to embed video tweets into your posts, there’s another option for you. Twitter recently came out with its own WordPress plugin that, among other features, includes the ability to embed video tweets simply by pasting a link to the tweet in the content editor. This works with some other video-hosting platforms as well, including Vimeo and YouTube. WordPress has long had the ability to embed regular tweets just by pasting a link, and with the official plugin you can extend that functionality to video tweets. Do you think Twitter hosting its own videos is a good idea? Thanks foe sharing this useful article. I get more idea from your article.